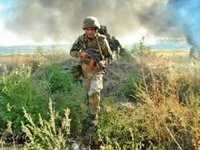 Occupation forces fired on the Armed Forces' positions in Donbas 14 times over the past 24 hours, one soldier had been killed, two more wounded, the press center of the Joint Forces Operation (JFO) has reported. "On April 12, the armed forces of the Russian Federation fired on the positions of the JFO forces 14 times, using 64 units of 120 mm and 82 mm caliber mortar bombs that are prohibited by the Minsk Agreements," according to the report on Facebook. The enemy also shelled Ukrainian defenders from grenade launchers of various systems, large-caliber machine guns and small arms.